The United States Mint will begin accepting orders for one ounce 2010 American Gold Buffalo bullion coins on April 29, 2010, according to a memo provided to authorized purchasers. The American Gold Buffalo coins have been offered by the United States Mint each year since 2006. The coins feature James Earle Fraser’s design for the Buffalo Nickel, minted for circulation from 1913 to 1938. The obverse of the coin features the portrait of a Native American and the reverse depicts an American Bison (or Buffalo). The Gold Buffalo coins are struck in a composition of 24 karat gold. The bullion version has only been offered in one ounce size. Similar to other bullion coin offerings, the United States Mint will distribute the 2010 Gold Buffalo coins through their network of authorized purchasers. These bulk bullion buyers are required to meet certain requirements related to their business and must also facilitate a two-way market for the bullion coins. The authorized purchasers are able to order the coins directly from the US Mint and then resell the coins to other bullion dealers, coin dealers, and the public. 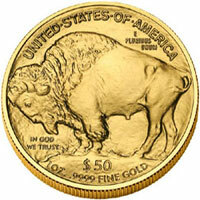 Last year, sales of the 2009 Gold Buffalo bullion coins did not begin until October 15, 2009. The pace of sales was extremely strong and by December 4, 2009, the US Mint had sold out of the available inventory. In total, there were 200,000 of the 2009-dated Gold Buffalo bullion coins produced and sold. The US Mint also offered the 2009 Gold Buffalo Proof Coin for collectors starting on October 29, 2009. These coins sold out on March 29, 2009 with last reported sales of 49,388. The US Mint has stated that they plan to offer a 2010 Proof Gold Buffalo, although details of the release are not yet available.